WordPress was released in 2003. Since then, it has steadily grown to become the most popular system for blogging and websites. The majority of the popular websites use WordPress these days. The reason for this massive growth in popularity is quite basic. 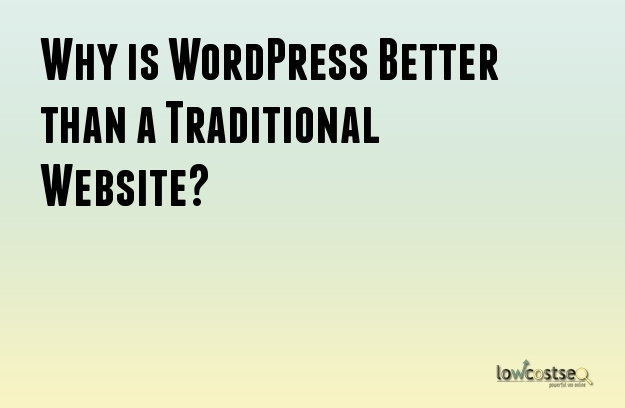 WordPress is a much better option than a traditional website. Here are a few reasons why you should start thinking about using WordPress if you have not done so already. There is no need to hire a web designer just to add a few more pages to the website or make simple text changes. You can make these edits and modifications yourself rather easily. This means, you can save quite a bit of money by not hiring a web designer for the simple things. One of the beautiful things about WordPress is that you can add content or make modifications from any computer, anywhere in the world. All you need is a browser and an internet connection. There is no need to install software or change firewall settings. You can use the page template to add as many pages you want. This keeps your website consistent in its design making it easier for visitors. WordPress offers you the ability to schedule your content updates or blog posts. You can add as much content as you want and still let them be posted automatically at different times or days. You do not require a web designer to create new pages for you. This allows you to add new pages as soon as you want. That in turn means that your visitors and customers will have the latest updates immediately. WordPress is highly compatible with the various social media networks. You can integrate different social media networks such as Facebook, Twitter and LinkedIn with WordPress. This means, your updates and posts will automatically be shared on the different social networks. You no longer have to open up each network to share the updates. The WordPress code has been constructed consistently. It has been streamlined as well. Excessive and unnecessary code has been eliminated. This makes it easier for Google to index WordPress websites. With the correct setup, you can completely customize your website. This increases the chances of your website attaining a higher rank in search results. With WordPress you can enjoy many benefits apart from the ones mentioned here. It is not difficult to start using the system or understanding its functionalities. Security is not an issue with WordPress either. It is difficult to get a website builder as good as WordPress now. Moreover, the system is updated constantly making it suitable for long-term use.